Ok…so its really a triangle…but it will look more like a chevron when completed, because I have decided it needs a little something more. Because the chain maille moves almost like a fabric, it also bends and folds when you don’t want it to, so getting the shape to lie flat on the neck can sometimes require adjusting the orignal plan. In this case, I plan to build up both sides to bring a natural curve into the top part which should make it sit on the neck nicely. I have taken a little break though to incorporate some more beadwork into my chain maille. 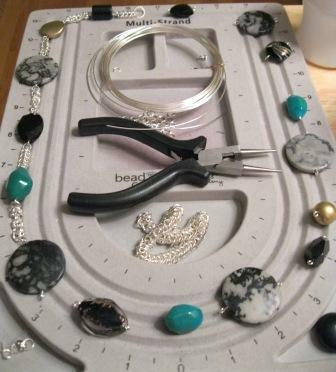 I was inspired by a friends use of crystals and Byzantine chain maille to make a really interesting necklace. So what I have decided to do was use some really funky large pieces I have and work them into a necklace with a combination of Queen’s chain and Byzantine. That’s it for today folks, although I also have some wire crochet started with pearls and a couple of secret projects that cannot be discussed until completed and delievered to their recipients.